On a bare stage strewn with tower PCs, Playstation controllers and energy drinks, three professional video gamers prepare for the biggest event of their team career: the final of the League of Legends playoff at Wembley Arena. And they’re nervous as hell. They’re all popping Adderall, a medication for ADHD that keeps gamers sharp. “We are athletes,” Glen (played robustly by Will Pinhey) tells his dad. Meanwhile Glen’s brother, Kieran (played with a twitchy intensity by Ben Mallett) is more scared than he’s ever been before, and he’s starting to fall apart at the seams. “I like to think that all we’re seeing isn’t real at all, it’s code,” he admits, as the real world begins to unravel for him. The third member of the team is Tammy, unusual for being a girl gamer, who’s there because gaming is the only thing that motivates her. “I don’t have any other life,” she admits in a petulant, compelling performance from Franci Donovan-Brady. The game itself is neither seen nor explained, beyond its title. 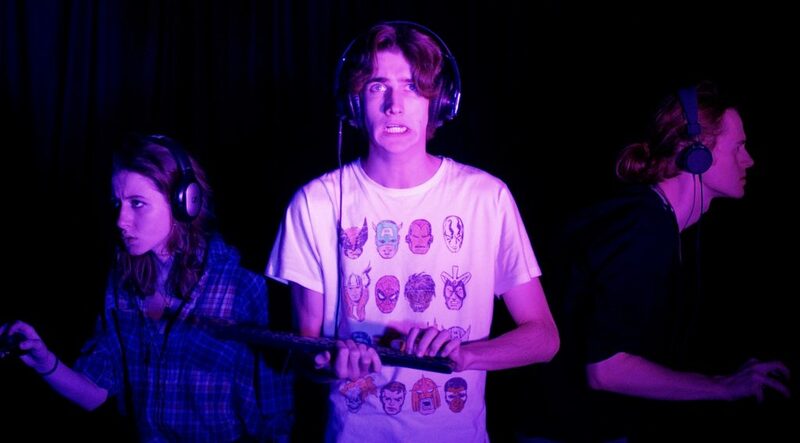 The three gamers, playing as a team, stare intensely into the audience as they wrangle two keyboards and a mouse between them with, surprisingly, not a game controller or joystick in sight. Their inevitable defeat is crushing and demoralising, leaving the gamers feeling tortured by their chosen path; they get no pleasure from the activity. Cotton takes its name from the line “What if, right, what if instead of making our home from concrete – what if we made it from cotton? Feathers? Liquorice?”. It’s an exploration of the dark underbelly of professional gaming, and it is relentlessly downbeat in its assessment. There’s no spark of joy or humour here; the three players are miserable, frustrated and angry, and it’s hard to see why they took to this way of life in the first place. Part of the problem is that the writer, Alex Benjamin, who also directed, seems to have little understanding of the worlds of gaming and social media. The mechanism by which the characters play the game seems implausible, and they never discuss the game’s strategy or goals; it appears that League of Legends has never been thought through as a gaming concept. When Kieran live blogs, his friends are amazed that he’s managed to acquire 6000 followers; but that’s a laughably small number by blogging standards, and in the supposed weeks that follow whenever he’s asked how many “views” he has, it’s still 6000. Despite valiant performances from the cast of four, an hour of unremitting anguish devoid of humour or lightness doesn’t make for a great night out.